What Drove Early Man Across Globe? Climate Change Some of the biggest human migrations coincided with major changes in climate, according to a new analysis. Researchers say early humans set out in search of climates where more food was available. And some populations stayed put in certain locations because barriers like glaciers blocked their progress. 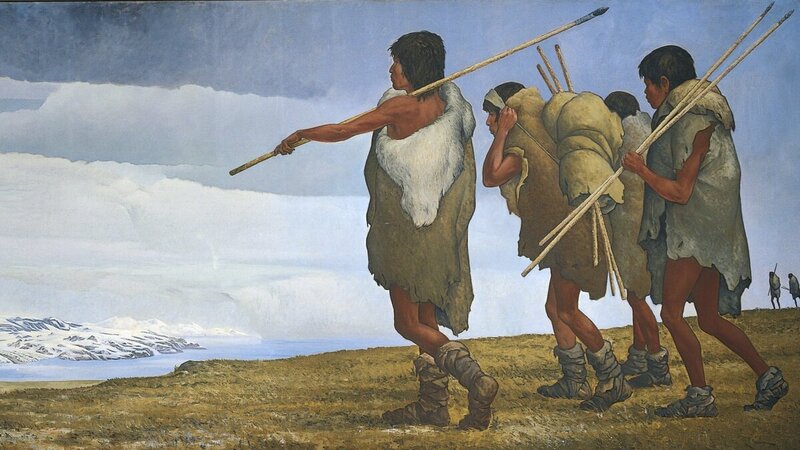 An artist's re-creation of the first human migration to North America from across the Bering Sea. Anthropologists believe early humans evolved in Africa and then moved out from there in successive waves. However, what drove their migrations has been a matter of conjecture. One new explanation is climate change. Anthropologist Anders Erikkson of Cambridge University in England says the first few hardy humans who left Africa might've gone earlier but couldn't. Northeastern Africa — the only route to Asia and beyond — was literally a no man's land. "The people couldn't really couldn't leave," he says. "The climate was too arid and too hot, so humans were bottled up." Eventually they got out of the bottle — we know that from the trail of fossil bones and stone tools they left behind. And recently, scientists have learned to read genetic mutations in current populations to track where our ancestors went for the past 70,000 years or so. To this, the Cambridge scientists have now added climate change. Climate change leaves a trail in sediments, buried pollen, coral, even dust. The scientists compared that record with the record of human migration gleaned from genetics and fossils. Writing in the Proceedings of the National Academy of Sciences, the Cambridge team says changes in climate coincided with some of the big migrations — through Asia, then north to Europe and eventually all the way to Australia and North America. One thing climate controlled was food. Andrea Manica from the Cambridge team says, "The main thing that really drives a lot of the migrations is actually temperature and precipitation to provide food — how much green matter did you have available in each location?" Green matter to eat, or to provide food for animals they could hunt. Manica says populations also stayed put in certain places because there were barriers like high sea levels or glaciers that blocked their progress. "So you had a buildup of a pretty good stable population, until eventually, that barrier got removed," Manica explains — that is, until sea levels dropped or glaciers melted. Manica says that happened in south Asia, which was a sort of "hub" for thousands of years until dropping sea levels opened up new migration routes. Same with Siberia, thousands of years later, when glaciers melted and allowed people to cross the land bridge across the Bering Sea. Anthropologists who've reviewed this new analysis say it will give them a much better road map of how humans populated the planet than just following the fossilized bones.